Much of Europe’s e-waste ends up on dumps in Africa. The social, environmental and health effects are devastating. Electronic waste is big business for some, but a hazard to others. Computers, mobile phones, TVs and home appliances have become an intrinsic part of our daily high-tech lives, revolutionizing the way we interact, communicate and view the world. Keeping up with the latest models and lifestyle products has firmly positioned us consumers as the driving force behind a runaway cycle of technological advancement. But what exactly happens to our e-waste – our broken computer when we throw it away? Where does that old phone go when we upgrade? Much of this e-waste ends up in developing countries. In Ghana, for example, an entire e-waste recycling industry has emerged. Men, women and children toil at open fires, extracting valuable materials such as cobalt, coltan and copper from the e-waste. Many get sick or die as a result of exposure to toxic fumes. From the US to Britain, Accra to Amsterdam, the e-waste documentary ‘E-Life’ investigates the social and environmental consequences of our electronic waste. The documentary also presents some innovative solutions for reducing e-waste at its source and recycling it more safely. E-waste, the term given to discarded electronic appliances, is often shipped by developed nations to poorer countries such as Ghana. 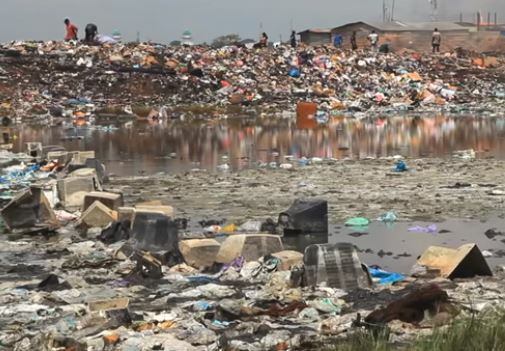 RTD visits the country’s most infamous dumping ground, Agbogbloshie. Locals call it “Sodom and Gomorrah” after the infamous Biblical sin cities. Its air and soil are polluted with toxic chemicals, while extreme poverty, child labour and criminal gangs are also rife.